Jaipur: Founded in AD 1727 by Sawai Jaisingh II, Jaipur the capital of Rajasthan is popularly known as the Pink City with broad avenues and spacious gardens. The capital of Rajasthan, Jaipur is steeped in history and culture. Here the past comes alive in magnificent forts and palaces, blushed pink, where once lived the maharajas. The bustling bazaars of Jaipur, famous for Rajasthani jewellery, fabric and shoes, This fascinating city with its romantic charm takes you to an epoch of royalty and tradition. Jaipur has been recommended in the ancient Indian treatise on architecture. Each grid consists of a square, and these have been planned so that, at the heart of the city is the City Palace. Spread around it, in rows, are public buildings, the residences of noblemen, the living and trading quarters of merchants and artisans. Straight, wide roads run through the city, while a high, crenellated wall that forms its defense is pierced with seven gateways that serve as entry points. Today, these walls may be more difficult to spot since the city has grown far beyond its original plan, but they are still there. After breakfast visit to the impressive Amber Fort: situated on a ridge just outside Jaipur City. At the foot of the hill you will mount your caparisoned elephant for the slow but steady climb up to the main gate, making your entrance in the time honoured fashion. The Fort, completed in the early 18th century, took over 100 years to build and now, although deserted, offers a fascinating insight into the lifestyle of the Moghul ruling families. Jodhpur: history revolves around the Rathore Clan. Rao Jodha, the chief of the Rathore clan, is credited with the origin of Jodhpur in India. He founded Jodhpur in 1459. The city is named after him only. It was previously known as Marwar. The following paragraphs will tell you more about the past of Jodhpur, Rajasthan.The Rathores were driven out of their original homeland, Kaunaj, by Afghans. They fled to Pali, near to the present day Jodhpur. Rathore Siahaji married the sister of a local prince. This helped the Rathores to establish and strengthen themselves in this region. In some time they ousted the Pratiharas of Mandore, just 9 km of today's Jodhpur. Initially, Mandore served as their capital, but, by 1459, Rathores felt a need for a secure capital. This lead to the formation of Jodhpur, the Sun City, by Rao Jodha. Enroute visit Ajmer: the city where the Dargah of the Great Sufi Saint Khwaja Moinuddin Chishti stands, is a sacred centre of pilgrimage. Hallowed by the memories of the great seer, Ajmer has earned the epithet of “ Madinatul Hind or the Madina of India”. Devotees of all sects and faiths come here as the saint’s blessings are infallible for all.Each year, the followers of the master congregate here from all parts of the world on the occasion of the annual festival of Urs to pay their obeisance to seek the Saint’s blessings for fulfillment of wishes. After breakfast visit to the Mehrangarh Fort: situated on a low sandstone hill. Within the fort, visit Moti Mahal and Phool Mahal. Also Jaswant Thada, an imposing marble cenotaph, built in memory of Maharaja Jaswant singh II around 1899 and Umaid Public gardens. Udaipur :formally known as the city of lakes and Venice of East. Udaipur, the capital of the former princely state of Mewar is a beautiful city in Rajasthan, India. Udaipur is also referred to as the "Venice of the East" , the "Most Romantic City of India" and the "Kashmir of Rajasthan". 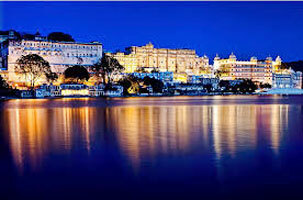 Udaipur the “City of Lakes” is one among the most romantic and most beautiful cities of India. The city of Dawn, Udaipur is a lovely land around the azure water lakes, hemmed in by the lush hills of the Aravalis. 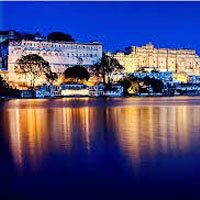 A vision in white drenched in romance and beauty, Udaipur city of Rajasthan state is a fascinating blend of sights, sounds and experiences - an inspiration for the imagination of the poets, painters and writers. Their reflection in the placid waters of the Lake Pichhola is an enticing sight. After breakfast visit to sight seeing tour of Udaipur. Enjoy picturesque lake Pichola set on the backdrop of Aravali hills, established in 1559 by Maharana Udai Singh, is nick named as ‘Kashmir of Rajasthan’ or ‘Venice of the East’, owing to its natural beauty; enchanting location and picturesque surroundings. The City Palace museum, the Jagdish temple, Sahelion Ki Bari (Queen’s resort for their friends) Bhartiya Lok Kala Mandir (Folk art museum) and the Pratap Memorial. Later back to hotel . Rest of the day free for leisure. Overnight stay at hotel in Udaipur. After breakfast, check out from hotel & Transfer to airport/railway station for onwards destination.